There is no better year than an election year to teach a course about government information, and this election year offers us plenty to go on. Last time I taught this course in an election year, students participated in archiving the social media of the federal government and of electoral candidates. The project is described in Signal, the Library of Congress preservation blogs, and resulted in several publications. We’ll have to see what unfolds by Aug 2016, but some likely candidates now are Supreme Court nominations, maybe something building on VisualFA , another project accomplished with significant contributions by students, or perhaps another collaboration with the Library of Congress End of Term Harvest team. The 2015 syllabus is available here, an updated version will be available in the summer once some political dust settles. This is a new course that I am currently developing and the syllabus attached here is still very much in draft version. We will examine the role of information and information professionals in human rights activism. How do we fill our role with dignity and honor to the people we serve. How do we avoid mistakes made in the past by NGOs and the United Nations, journalist. We will work around three case studies and culminate with the 2030 U.N. Agenda. We can possibly make this related to the 2030 UN Agenda. We are pleased to present to you a new edition of the Map Warper tutorial, created Dec. 2013 and uploaded March 2014. In this tutorial, you will learn how to use the New York Public Library’s Map Warper tool to bring the past into the digital present. This tutorial will show you how to overlay historical maps onto present day locations by georectfying, or warping maps from the NYPL collection. The Map Warper allows you to align an historical map with its contemporary counterpart. Rectifying maps contributes to the public domain. Once a map is rectified it becomes part of the NYPL rectified map collection and can be used and accessed by subsequent users. The Map Waprer allows users to become urban archeologists using digital tools to dig into the past and connect it to the present. This tutorial was created by Corina Bardoff, Leah Honor and Bill Levay, MLIS candidates at Pratt Institute, School of Information and Library Science. This project was as assignment for the course Information Services and Sources. The class partnered with the Map Division at NYPL to update their tutorial, which was very long (over 10min.) and outdated. Working in groups of 2-4 students and using Camtasia, the class created eight tutorials. All were excellent in their own way and the competition was hard, but ultimately the good people at NYPL, led by Matt Knutzen selected this tutorial (See on NYPL website). We are glad to have had this opportunity to work with NYPL and look forward to future collaborations. August is upon us, and for people like me, who live by the academic calendar, it always comes with a sense of panic: “I can’t believe it’s already August—I didn’t do half of what I wanted to.” I am way behind on all my projects, and deadlines are looming near. As always, it will be a race to the end. This year, I put aside the first week of August for a week of Contemplative Pedagogy. 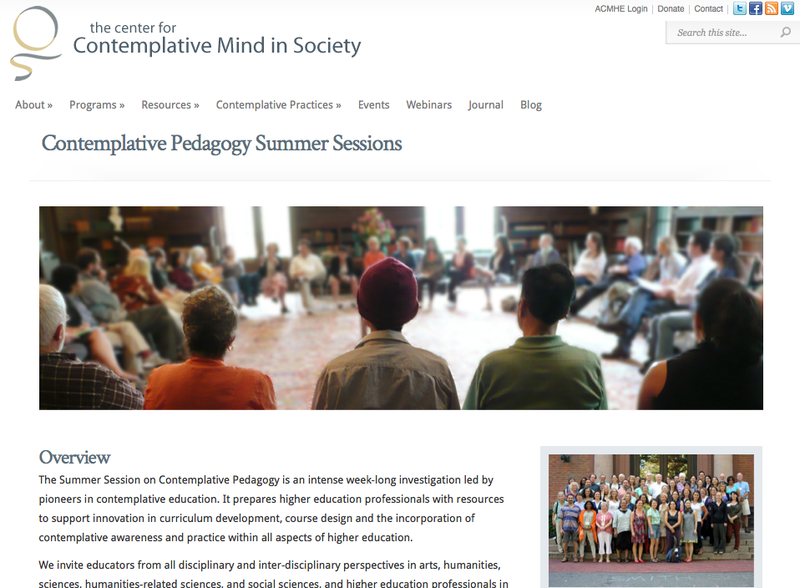 The summer session was offered by the Center for Contemplative Mind in Society, a nonprofit at Amherst College with a vision of introducing “contemplative … practices and perspectives to create active learning and research environments that look deeply into experience and meaning for all in service of a more just and compassionate society.” In the words of Executive Director Daniel Barbezat, contemplative practices help students arrive and be present in class, and provide a supportive environment for inquiry. Education, continues Dan, is an opportunity to cultivate a deep personal and social awareness, stimulating exploration of what is most meaningful to us as interconnected human beings. I first heard about the Center from an interview on NPR’s On Being with Arthur Zajonc, who was at the time executive director of the center. I was intrigued by much of what Arthur said about using contemplative practices to cultivate attention and as a mode to inquiry. Following the interview, I read Zajonc’s book Meditation as Contemplative Inquiry and the book he co-authored with Parker Palmer, The Heart of Higher Education. Of the many meditation books I have read over the years, this is the one I can relate to most. Zajonc contextualizes contemplative practices in both Eastern and Western traditions. There is as much Goethe and Rilke as there is Zen and Buddhism. There are taxonomies and epistemologies and jargon I can connect with to clarify experiences and actions. The book moved forward my personal yoga and meditation practices, and changed the way I think about my teaching. While I don’t walk into class and open with a five-minute meditation (as some of the summer session participants do), I realized that much of what I teach tries to instill mindfulness in how students think about problems. Examples of this would include ethical approaches to crafting information policies, empathy and reflective exercises with regard to the reference interview, or discussion of social responsibility in collection development. So the next natural step was to attend the Summer Session at Smith College. Smith College, for those who are not familiar with it, is one of those storybook New England colleges clad in green lawns, mature trees, old buildings, and proud tradition. Founded in 1891, Smith is one of the Seven Sisters, and sits in a lovely college town with welcoming cafés, bookstores, and boutiques. Eighty people attended the summer session. With few exceptions (one high-school teacher, a couple of administrators, a couple of Ph.D. students), all were faculty members at universities in the U.S. and Canada. Every type of higher ed institution was represented, from Ivy Leagues to a new small online for-profit university. Participants came from public universities (CUNY, Arizona State, Kansas State), private universities (Pratt, Syracuse, Kenyon), Christian universities (University of San Diego, Baylor), community colleges (Baltimore County, LaGuardia), and some uniquely focused schools such as Naropa, a Tibetan Buddhist university in Colorado. In terms of disciplines, most were from the arts, humanities, and social sciences, with backgrounds in psychology, counseling, English literature, music, arts, economics, sociology, global studies, and more. Several had attended summer sessions and other Center events in the past, but many were first-timers. People explained that their situations vary greatly, and there are many ways they introduce mindful practices in their teaching. Some do so directly; they may incorporate a five-minute meditation or a walking meditation in the class. Other include such practices in their assignments. Some still don’t do anything and have come there to learn, and others, such as myself, introduce mindfulness indirectly as a subtheme of the course. I was saddened to hear that many people referred to themselves as being “in the closet” at their universities. They are discouraged from exploring contemplative pedagogy, and are unable to discuss this with their colleagues. I have to say that I really just don’t get it. Shouldn’t contemplation and mindfulness be the underlying foundation of all education? One participant told me that in her first career she worked in a policy think-tank, and ten years later became a university faculty member—she described it as moving from a think-tank to an unthink-tank. I was dismayed by the level of closed-mindedness at too many universities, and grateful to be at Pratt SILS. I was thrilled to learn that Arthur Zajonc was on this year’s summer session faculty, and was not disappointed. Arthur led a total of five sessions: a contemplative practice, a two-part presentation, and a two-part workshop. All sessions examined aspects of moving between focused attention and open awareness, holding both an open mind and an open heart. Arthur’s presentations are rich in substance and culture, anchored in a deep intellectual history of philosophy and literature. They examine contemplative pedagogy in terms of epistemologies, quoting Parker Palmer, who said that every way of knowing is a way of living and every epistemology becomes an ethic. There were two movement classes a day, the morning session with Yin Mei and the afternoon class with Paula Sager. Both focused on authentic movement, a practice that helps explore the authentic force that moves us. 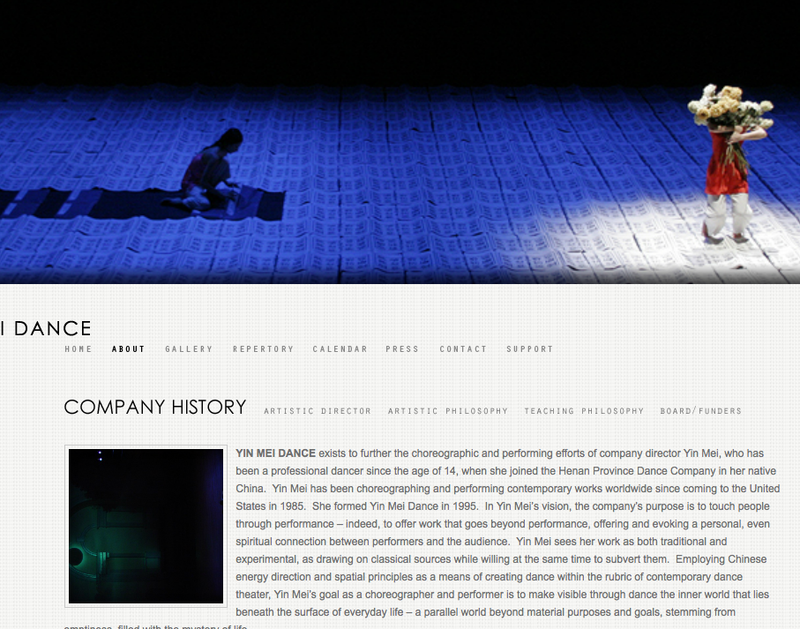 Yin Mei teaches choreography at Queens College, and is a dancer and choreographer. Her movement class had some vocabulary in common with Tai Chi, but was more expressive. It was also very energizing as a morning workout before the more academic classes. Paula is a dance teacher and researcher, and has conducted research on the phenomenon of witness consciousness in the development of the individual. Much of the work in her class is done in groups or with a partner, and consists of alternating roles. For me personally, the experiential sessions, which included the movement session and the contemplative practices, were where I gained the most insight into what contemplative pedagogy is and can be. Mirabai’s compassion meditation was the perfect example of how meaningful witnessing and holding can be. Both Raul Quinones, talking about antiracism, and Vaishali Mamgain, an economist specializing in immigrant issues, discussed having to live with complexity and contradiction, and recognizing the importance of action. We often do so little because we think we do not make a difference, but it is our responsibility to demonstrate to students, through the work we do together in class, that every action counts. Vaishali told how her rather traditional data-driven economic research took a turn toward the contemplative. As a freshly minted Ph.D. she found herself at the University of Southern Maine. The area had a large immigrant community, and Vaishali decided to research immigrant employment and labor issues. She gathered all the data, analyzed it, and wrote the article. When the reviewers returned their comments they praised the research questions and methodology, but one reviewer asked, Did you talk to any of the immigrants? Talk? What a reactionary concept! Economists don’t talk to people, they analyze data. Vaishali went back to the immigrant center, began talking to people, and her life has never been the same. Vaishali now teaches about food politics in Southern Maine and helps students, many of whom come from fishing communities, to live with the conflicting pull of food politics, the humane treatment of animals, and their livelihood. Some people accuse contemplative practitioners of escapism, but the discussion in the summer session surrounding information technology showed that nothing can be further from the truth. All participants recognize that technology is a part of both our own and our students’ lives, and David Levy demonstrated some concrete examples of using technology in mindful ways. David, a professor from the Information School at the University of Washington, and thus the closest to me in terms of discipline, talked about the course he teaches called Information and Contemplation. Thinking, David explains, is a slow process, but we live in a world that is all about accelerated production and consumption. Through exercises and discussion, he shows students ways to think reflectively about their use of technology, and to use it in ways that can better themselves and their surroundings. Most university faculty are trained in their specific disciplines, and few have an education in pedagogical theory of any kind. We teach hundreds of students over our careers, yet have never learned what is important in teaching and what works best. Contemplative pedagogy is as much about the pedagogy itself as it is about contemplative practices. As Dan cautioned, as educators we must lead gently and be confident in our own practices. For me, the inquiry continues. The verdict is in, and the verdict on this particular occasion takes the form of student evaluations. Let me tell you, you never stop feeling a bit wary of them. When the envelope comes, or—as in the past two semesters—the PDFs, my heart skips a beat before I begin to read them. But that is a little beside the point. I was just reminded of the downside of the one-size-fits-all evaluation form we get from the Brooklyn campus, namely the question asking students to indicate to what degree the course increased my understanding of environmental sustainability. Sustainability? Why am I asked to teach sustainability? When did that become an overarching societal value? Why should my courses not increase compassion, or reflection, or social responsibility, or understanding of First Amendment rights, given that we are an information school? And to this list of values I would like to add resilience. 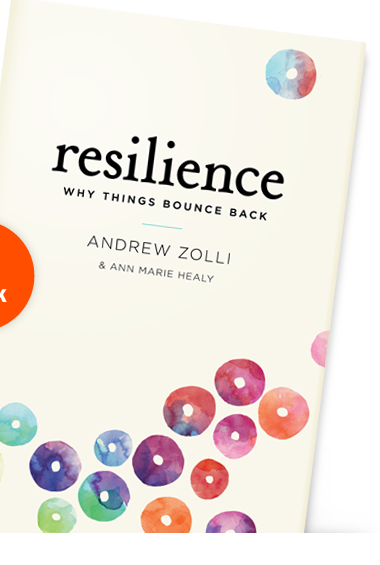 Resilience asks “how to support people and create systems that know how to recover, persist, and even to thrive in the face of change.” Andrew Zolli is a “thought leader and curator of a new idea, ‘resilience thinking,’” and was recently interviewed on On Being [all quotes are from the transcript] about his ideas and his book Resilience: Why Things Bounce Back. the ecological system, the economic system, the geopolitical system, the climate system, the food security system are all connected to each other in ways that cause very complex highly unpredictable nonlinear outcomes. So all of those systems being connected leads us to a place where increasingly instead of trying to find an equilibrium in a planet that’s out of balance, we also have to try and manage with the unbalances, the imbalances. We have to manage in a world that’s intrinsically out of order. … a big part of that story is about emboldening the local. Because we’ve so tightly connected all of these systems, it’s important that we have redundancy. It’s important that we have spare capacity. It’s important that we have the right kinds of social networks, so that we can share with each other. It’s important that we have a shared wisdom, a body of knowledge that helps us be more locally self-reliant. While this is my first introduction to Zolli (copies of his book are on order at PMC), creating redundancy in systems so that they are more resilient against vulnerabilities is a familiar notion in collection preservation. In fact, it is the principle at the heart of LOCKSS (Lots of Copies Keep Stuff Safe), a dispersed digital preservation system from Stanford University. Instead of preserving materials in a centralized way, exposing content to system failure, LOCKSS allows each participating library to preserve its own digital collection through a distributed network, cooperating with one another to assure that the content remain accessible and intact. This is just one of several examples that ran through my mind as I was applying resilience thinking to libraries and models of scholarly communication. I hope to further explore these themes in my fall course, Academic Libraries and Scholarly Communication. I am excited about introducing students to the concept, and discussing with them its relevancy to academic libraries. Resilience thinking could provide libraries with a roadmap to growth, while sustainability—for all its emphasis on the future—has had very limited positive affect on libraries. Time to write the syllabus. For the past two semesters, students taking my Information Services and Sources course (LIS 652) created miNYstories as part of the course requirements. miNYstories are short photo podcasts about New York City and each semester we have been inspired by a New York centric book. Students assembled photographs and music from public archives such as the New York Public Library Digital Gallery and the NYC Municipal Archive Gallery, and added them to a well-researched narrative. The miNYstories tell about the history and style of public fountains in the city, the history of Automat restaurants, the history of waste management in the city, and many more. It is quite amazing how much you can learn about New York by watching the miNYstories, I hope you take the time to do so. I am a professor at the School of Information at Pratt Institute and LIS program coordinator . Both my research and teaching address the communication of knowledge within the areas of information policy, government information and scholarly communication. Theoretically, I draw from the framework described by Siva Vaidhyanathan as Critical Information Studies (2006). My teaching closely relates to my research interests. In addition to teaching our core Information Services and Sources course, I teach Government Information Sources, Information and Human Rights, Information Policy, and Reference & Instruction. Information and Human Rights, Part II Semester’s end: The short of it.